Summary: In the summer of 1942, twenty-one-year-old Anne Calloway, newly engaged, sets off to serve in the Army Nurse Corps on the Pacific island of Bora-Bora. More exhilarated by the adventure of a lifetime than she ever was by her predictable fiancé, she is drawn to a mysterious soldier named Westry, and their friendship soon blossoms into hues as deep as the hibiscus flowers native to the island. Under the thatched roof of an abandoned beach bungalow, the two share a private world-until they witness a gruesome crime, Westry is suddenly redeployed, and the idyll vanishes into the winds of war. 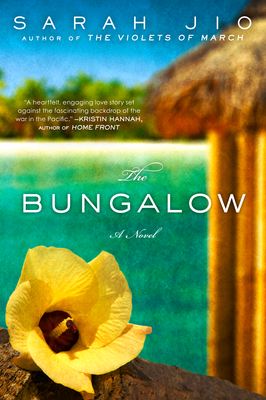 One of the books that I was looking forward to reading over the Christmas holidays was THE BUNGALOW by Sarah Jio. I'm been anxious to read it ever since Ms. Jio mentioned it to me after I finished reviewing her first novel THE VIOLETS OF MARCH. While I didn't exactly "relate" to the main character in THE VIOLETS OF MARCH, I still appreciated Ms. Jio's writing style and storytelling abilities. And when I learned that her latest novel would be about World War II, I thought it might be a better fit for me. Now, you might think that THE BUNGALOW is a romance story based on my last paragraph, and it is, but it is also so much more than that. (And I'm guessing that those reasons are probably why I ended up enjoying this novel.) I found that I really appreciated the way this story unfolded -- it actually kept me turning the pages. The story begins in the present day when Anne receives a letter concerning a mystery that occurred when she was a resident on the island of Bora-Bora during World War II. She and her granddaughter decide to visit the island and the trip dredges up a lot of old memories for Anne. The story is then told in one big flashback until the very end of the novel. Because the story was told in this way, I was extremely curious to see how Anne's life played out both during the war and after. So needless to say, I was anxious to find out about Anne -- what happened between her and Westly as well as her future without him, but I also wanted to know what happened to Anne's friend Kitty. Throughout the novel, there were quite a few secrets involving Kitty and eventually the end of their friendship. I had my guesses about Kitty, but I admit to being a little surprised by how her story eventually played out. In addition, I was extremely curious to discover the resolution to another one of the novel's mysteries, namely the brutal murder of a native woman. There were a few twists and turns, both for Anne and the reader; and I thought Ms. Jio did a wonderful job of building suspense for the reader. I definitely think THE BUNGALOW as an interesting discussion book. In fact, I know Ms. Jio makes herself available to discuss her novels with book clubs, and I'm sure she'd add a lot to any discussion. There is a reading guide available for this novel with thirteen thought-provoking questions. Some of the themes you might want to discuss are living in the moment, love vs. passion, family dynamics, friendship, secrets, justice, and jealousy. I thoroughly enjoyed THE BUNGALOW and recommend it for fans of historical fiction, romance, women's fiction, and mystery! Thanks to the publisher for sending a review copy of this book. Wow, it sounds like this book has something for everyone. I'll have to pick up a copy soon. I'm very much looking forward to reading this book. I loved VIOLETS OF MARCH and Sarah Jio's writing style really resonates with me. Can't wait to read it! So many people have read this! And I just love the cover, which makes me interested too! This is one I've been eyeing jealously. It all started when I saw the book trailer. I was captivated. I don't really mind a love story as long as it isn't too sappy. I am hoping to read this in January. You've encouraged me to read it sooner than later. I got this one over Christmas for myself with a gc. I am glad that it is more than a romance. I liked the time period, so I took a chance. I am hoping to read this in January too! I am very excited at the idea of it, even though I haven't actually read Sarah Jio before! I have seen this book on several blogs and now I want to read it too. I only like romance if it's not the main theme of the book but part of a bigger picture.